We have all seen the promotions and giveaways luring families to the resort. Book now and save big for a family of four. What? Of course, you can book that 5th family member for an additional cost, which likely means a larger suite, for a much larger price tag. So what is a Disney Family of Five to do? Step 1: Relax. This is Disney we are talking about, not rocket science. Step 2: A little research goes a long way. Disney moms with families of all sizes have had to face the daunting task of choosing which resort hotel will make their vacation the most magical experience possible, while not busting the budget. This is a breakdown of resorts that fit a party of five without the cost of upgrading to suites. Value resorts: Forget about it. No standard rooms accommodate five people. Adjoining rooms are an option, and at these prices, the suites are available too… but I this involves upgrades and additional rooms. Moderate Resorts: The Port Orleans Riverside is a family favorite – there will likely be future blogs dedicated to this wonderful property. With an under bed trundle, a family of five, can enjoy a standard room without the upgrade to a suite. The Fort Wilderness Cabins come in a one-size-fits-all package, holding up to six guests. These have the added bonus of a full kitchen, making this a resort of choice for the family of five, and Grandma can come too! Deluxe resorts: I will just say that most Deluxe resorts will accommodate a family of five in a standard room via a couch / daybed contraption, which was surpizingly comfortable, and gives mom a place to take a nap while the kids watch a few classic Disney cartoons. *A word of warning: Do not try to ‘sneak’ in a fifth member of your family into any Disney resort hotel. It may work off-site, but not on Disney property. Be honest, and everyone will have a great trip. I am partial to families with just 5. That’s all. No more, no less. Just the 5!After all, even the First Family of Disney – the Fab Five, otherwise known as Mickey, Minnie, Donald, Goofy & Pluto – is a family of five. Magical! I love to think of my family as "The Fab Five!". Just thought I'd add that you can have five in a value resort standard room IF, and only if, the fifth is a baby in a crib. But, honestly? Crowded. 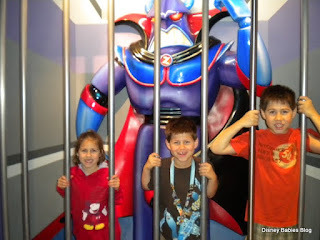 Our kids love Pop Century, so we go for connecting rooms and leave the doors between rooms open. We are also a family of five. Luckily, on our last trip my youngest wasn't three yet, so she didn't "count." But one thing we did was bring our small pop up UV Ray tent (our daughter was too big for a pack and play), which fit perfectly between the TV stand/bureau and the table. My two oldest children shared one bed and our littlest one slept in the tent. Mousekeeping was so sweet because they brought extra bedding for the tent and set up my 2yo's tent with all her dolls each morning. Just a tidbit about the tent too, it folds down to about 1/2 inch think and maybe 12" diameter circle, so it fit in the front pouch of our suitcase. Next trip all the kids will be over three, so we will definitely be staying in POR (our favorite moderate) with the trundle bed. This is a great post! We have three kids, so this post provides us with great insight! I have a question. Do you have to "claim" your fifth guest if they are under age 2 or 3? Thanks for all the comments. Having a family of five is an adventure. And yes, you do need to claim every guest, even babies, staying on site at a Walt Disney World Resort. However, there is no charge for infants and young toddlers. This helps Disney keep track of guest counts, and it helps Mousekeeping anticipate guest needs.